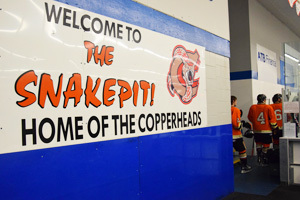 The Coaldale Copperheads battled against one of the top north division teams Saturday, the Snakes with only one game this weekend. Their lone game in the Red Deer Arena this season, was reminiscent of the league final of last season. Despite even shots of 26 each, the Copperheads eventually lost 3-1 with the Vipers scoring late in the third on an open net goal. A Copperheads two man break away late in the third was stymied by the Red Deer Goal keeper to secure the win. Chase Williamson was the lone Copperhead to score with eight seconds left in the first period. The next home action is Saturday, Jan. 26, when the Okotoks Bisons (2nd place south) come to the Snake Pit. The Copperheads currently sit in first place in the south division with 54 points followed by Okotoks with 47 points and Cochrane with 44 points (three games behind the Copperheads). Saturday features student toonie admission and marks the second last home game of regular season. Playoffs will follow.